The fourth Monday of every month is Challenger’s Choice at Lens and Pen by Sally’s Weekly Phoneography Challenge. Sally provides us with a variety of subjects to pick from including street, night and architecture photography so today, I paged through my files looking for something that met at least a few of these criteria. 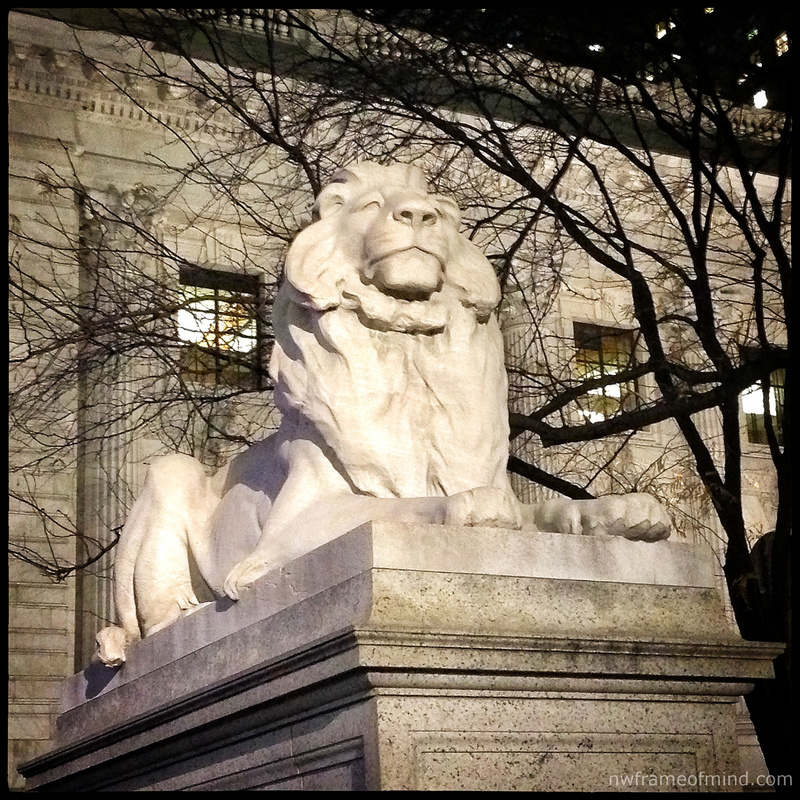 I like this shot of one of the NYC Public Library Lions taken during my trip to New York last December and since the only camera with me was my phone and I took this one on the street at night I thought it would be fun to re-work it and publish the new version today. I used the native camera in my iPhone 5 and used Snapseed for additional edits. A subject that makes a bolder statement through monochrome. Happy Phoneography Monday. I remember being in NYC years ago for a tradeshow and walking right by that lion and not having a camera on hand. Thanks for reminding me what he looks like! You’re welcome. 🙂 I hope you had a great visit during your tradeshow! Great photo! It reminded me the lion outside of the Art Institute of Chicago. Nice shot of the lion – I have always loved them. I love those lions! Now you’ll need to add the ones from the Boston Public Library! così fotografato il leone è un vero re!